These Industrial Identification labels are manufactured from durable 316L grade stainless steel. Supplied in a DP1 (brushed) finish, these labels are perfect for harsh industrial conditions such as salt water environments. The 316L steel is a marine grade which doesn’t corrode or rust and will stand the test of time. The steel is deeply etched to leave all lettering and/or logos in the materials surface. The lettering can be left unfilled to leave a subtle contrast against the darker surface or infilled with a long lasting paint to offer a more distinct finish. Supplied 75mm x 50mm x 1.00mm and supplied with bur-free straight edges, plates are supplied complete with either a self-adhesive backing or holes for rivets and screws. Corner radii can also be added in the ordering process. 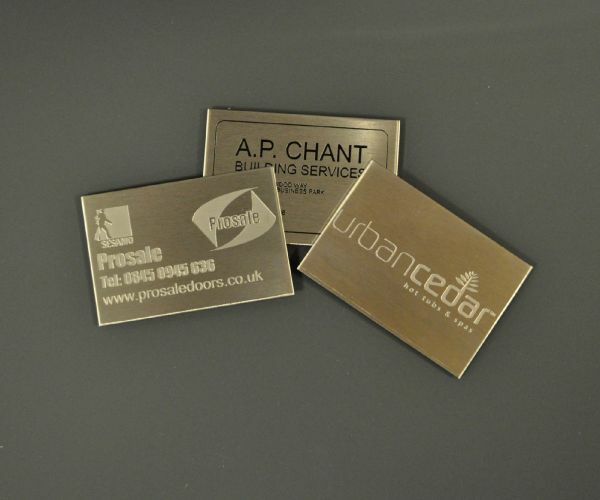 Etched Stainless Steel ID Labels can be supplied with 2 or 4 x 3mm fixing holes, self-adhesive or without any fixings.